What is it that I want, that I really really want? I'm in this peculiar place where a lot of things are in order: I got the husband, job, house. The best dog-child you can imagine. We both have our health (hubs and I, not Lily and I - but she is a picture of perfect health as well, in case you were wondering), which is the most important thing there is - trust me, I see it daily (hospital worker here). Of course, there are the never-ending, annoying responsibilities of adulthood: bills to pay, what to make for dinner, laundry (so much laundry, and we are only two people! ), oil changes, daily chores. Trying to keep up with yearly health checks, twice-yearly dentist appointments, monthly bang-trimming appointments. Taking care of the farm, with all its many tasks of feeding, watering, cleaning, de-worming, trimming, brushing, fixing, maintaining. Everyday life, with little annoyances, lots of little joys, the normal ebb and flow. Basically, what I'm saying is - it's a good life. A blessed life, and one that I am thankful for every day. I only have one life to live, and I want to live the hell out of it! I want to try, fail, succeed, jump head first into new endeavours, learn, step out of my comfort zone, experience new things! Here is the thing: Sometimes, I'm sure I'm happy with a calm life. Spending time with my husband, some precious friends, hanging out with the animals, going to work. Blogging, reading, taking pictures, watching some Netflix, repeat. But then, there are the other times. When I read about people's success stories. Hear about them achieving extraordinary things. When I listen to The Secret one more time, read some motivational quotes on Pinterest, or watch yet another rags-to-riches story on the Biography channel, I always inevitably ask myself: Is this it? Have I reached my pinnacle? Or is there more? Could I be just a bit more - extraordinary? So here is the question: What is it that I want? If I could choose anything in the world, anything at all, what would it be? Let's pretend there is a magical supermarket, where you can get whatever your heart desires. Success, wealth, looking like a supermodel, a world where carbs make you skinny and self doubts don't exist. What would you choose? A little house by the lake. Chickens scratching in the dirt, peacocks strutting their stuff, dogs lolling about, a couple horses grazing peacefully nearby. The farmer walking around, feeding bucket in hand, taking care of his animals. The farmer's wife sitting on the front porch, steaming cup of coffee beside her, her computer in front of her, watching him - and writing. You see, what it comes down to is my love for the written word. It has always been that way. From the time I could read, books were my solace. Everything else came after: playing with my sister, watching TV, having to play the piano. I always had to reluctantly tear myself away from a book to do these things. The characters in the books were my friends, as real to me as any real person in my life. I was never a writer though. As much as I enjoyed the writing challenges from school, I didn't do any writing at home. It was like I had this unspoken understanding about myself that while I loved to read, there was no way I could ever create stories myself. But you know what I think now? I had not found my language yet. My native language is German, that's all I read and spoke until I was 23 years old. And then I moved to Canada. Learning English was a revelation. I love it with all my heart. It flows so much easier, is so much more eloquent to me than German. I love reading it, speaking it, and most of all - writing it. Ever since I discovered blogging it has been the greatest joy for me to sit down every day and write. It's the first thing I think of when I wake up. It often is the last thing I think of before I fall asleep. It has become a friend to me, a loving supporter, challenger, teacher. There is nothing more exciting to me than these internal journeys I take: Thinking of blog post ideas. Dreaming up this story I want to write down, this book I have been creating in my mind for the better part of a year now. I think about it daily, jot down ideas, start it, discard it, start again. I have not felt ready yet. But what am I waiting for? For my doubts to dissolve? For my writing to get better? I know those fears will never really disappear. I guess what I need is a vision of myself, a picture of what I want my future to look like. Most of my dream picture is already complete: the man, farm, dogs, lake (it's really just a small pond, but no need to be picky now). What's missing is a clearer picture of this person I want to be - the writer part of me. I look up to these incredible women who do all these amazing things: Taylor, Amber, Katie, Drea, Melyssa, Elsie and Emma, Liane - and a little voice whispers into my ear: Why not go for it? I'd rather try and fail than not try at all. So here is a promise I'm making to myself, right now, right here: Stop dreaming, start doing. This change of seasons will bring a change in myself as well - changing dreams to goals. Let's do this, wannabe writer! What are your dreams and goals? Let's all chase them together! Great post! After a lot of thinking I decided that this year I would make some big changes in my life. Or at least baby steps to achieve my goals. I don't think it is ever too late to follow your dreams. You can make your dreams come true, of that I'm certain! You certainly have the PASSION and I love your writing. Keep writing and doing what you love and the rest will fall into place! This is amazing. Truly inspiring. Farm Girl you are so right - we really need to stop dreaming and start doing. I'm finding that when you just "do", life is so much better. Of course dreaming is great: spectacular actually, but actually putting those dreams into actions? Even better. I have this long list of "to-do"s - a Bucket List that's comprised of actually attainable goals and I'm going to start knocking items off of it. It's amazing how we put things on the backburner that don't fit into our everyday actualities. Do I have time to do such and such? No, I have a hw assignment and a trip to the grocery store. Am I confident enough to do such and such activity? No, it's outside of my comfort zone. Maybe one day. I'm with you - start doing! Start saying yes to new experiences! Start going for it! You go Miriam!!! This is so inspirational and a great reminder! I can't wait to order your book!! You are doing great and I know I will see you in print one day!! Now, I need to get my act together and figure out what I'm doing. Loved reading this -- I'm totally bookmarking it and giving it a read when I need a little inspiration. Go write and do your thing! Great post. Go for it, girl!!! I believe in you all the way!! NEVER stop dreaming! 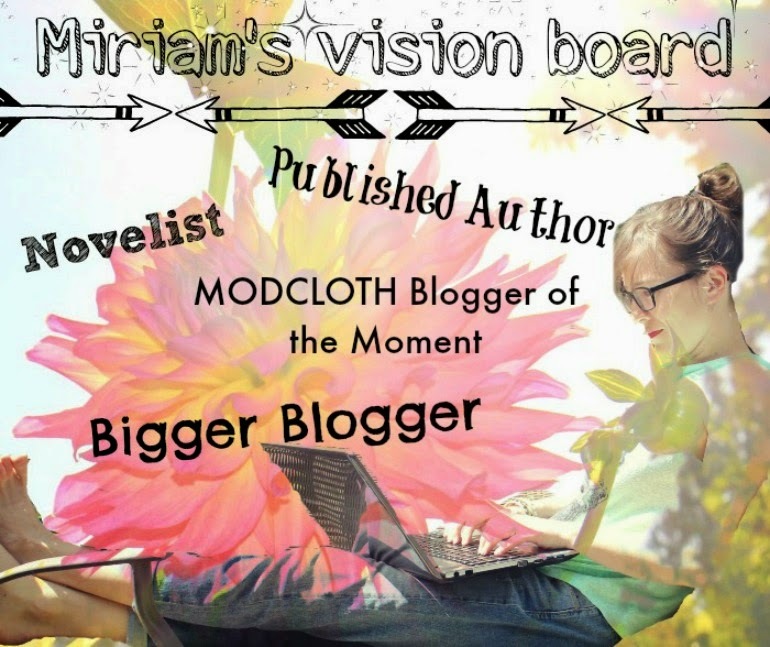 And I love the vision board idea!